Thank You for visiting the website for Rochester Field Hockey Camps and Clinics! We offer multiple camps and clinics throughout the year for players of all ages and abilities. Whether you are looking to improve your ability with top quality instruction from a college coaching staff or want to showcase your skills with the hopes of bringing your game to the next level, we have something for you. ​We look forward to seeing you out on the field! ​The University of Rochester Field Hockey Program has enjoyed great success with three trips to the NCAA Elite 8 (2012, 2015, 2017) and our coaching staff and student-athletes welcome the opportunity to work with our campers to improve their field hockey skills. 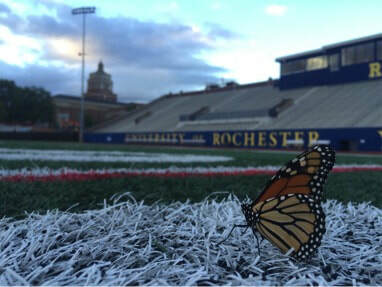 Our Overnight Camp is designed for varsity-level athletes who are planning to pursue a collegiate field hockey career at the University of Rochester or any collegiate program. This camp includes a campus tour for those recruits considering Rochester. Our Day Camp is designed for all field hockey athletes - beginner through varsity. Daily sessions include skill development sessions and game play. Each day includes an optional pool session and lunch in our cafeteria.